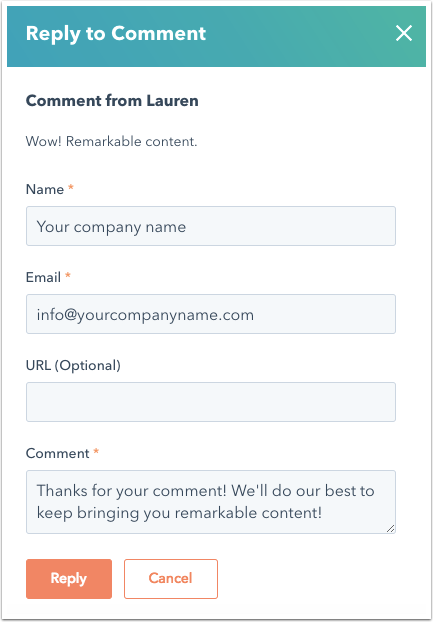 The comment settings for your HubSpot blog can be customized in several different ways. If you hope to encourage conversation between your readers and your blog author(s), you’ll want to leave blog commenting turned on. 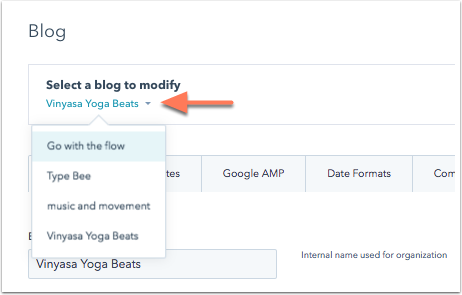 Learn how to customize your blog comment options and manage your blog comments. Click the Select a blog to modify dropdown menu and select a blog to edit. If you only have one blog, you'll only see one option in the dropdown menu. Click to toggle the Enable commenting switch ON. 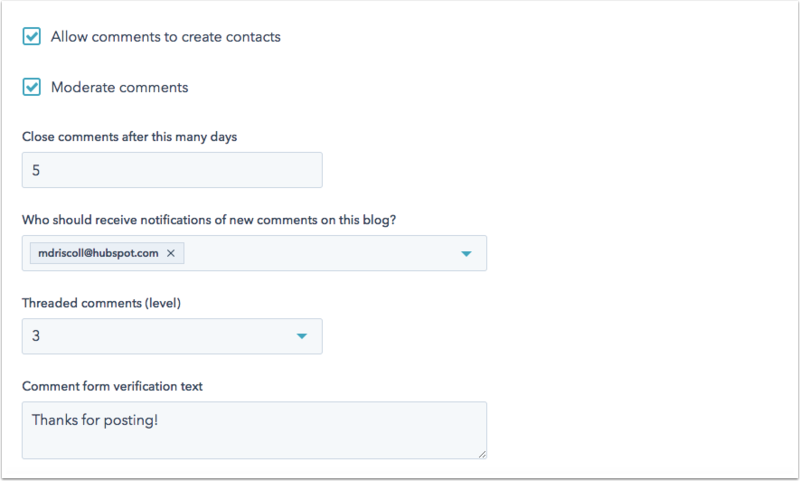 Select the Allow comments to create contacts checkbox if you want visitors who comment on your blog to be added to your contact database. Comments made by existing contacts will always be attributed to those contacts even if this setting is disabled. Please note: when you have this feature enabled along with the moderate comments feature, contacts will not be created until their blog comment is approved. Select the Moderate comments checkbox so that new comments won't be posted until someone on your team approves them. Enter a number in the Close comments after this many days field to prevent new comments on posts that are older than a specific number of days. Use the Who should receive notifications of new comments on this blog? dropdown menu and select a user to notify via email when a new comment is posted on the blog. Blog authors will automatically receive blog comment notifications if the blog author's email address is the email of a user in the portal. Click the Threaded comments (level) dropdown menu and select how many levels of comments you want to allow on your blog posts. You can have up to 10 levels of comments. In order to enable threaded comments, you must select a number greater than 1. Enter a customized thank you message in the Comment form verification text field. This is the text visitors will see after submitting a comment on your blog. When you're done configuring your settings, click Save. In the left sidebar menu, select Comments. Use the Filter by dropdown menus to filter comments by blog author or comment status. Click the All states dropdown menu and select Pending. Select the checkboxes next to the comments you want to approve, then click Mark as Approved to take the comment live on your blog post. Hover over the comment and click Reply. The dialog box will auto-fill information based on your HubSpot user information. Edit this information to use the name of your company and a general contact email address. Add your reply in the Comment field, then click Reply. If there's a comment submitted to your blog that you don't want to publish, hover over that comment. Then click the Actions dropdown menu and select Reject. To remove a comment, hover over a comment and click Delete. Hover over the comment, then click the Actions dropdown menu and select Mark as Spam. To reduce the number of spam comments you're seeing, you can enable CAPTCHA in your settings.